Clinic Synopsis: Martha Mooke, Electric 5-string Violist/Composer/Progressive Recording Artist, will introduce the fast-rising field of electric string instruments. Topics will include extended techniques, integration of electronics, and nontraditional performance practice, including improvisation. Ms. Mooke will also discuss what is necessary for teaching electric string instruments, what type of equipment is needed (amplification, audio processing), and available repertoire and resources. Clinician Biographical Information Martha Mooke, composer/electro-acoustic violist, a pioneer in the field of electric five string viola, transcends musical boundaries by synthesizing her classical music training with extended techniques, digital effects processing and improvisation. 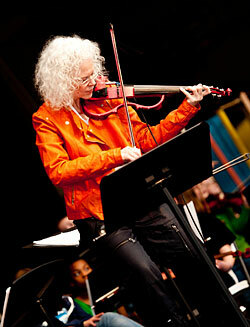 She is a Yamaha Artist and leading clinician on electric and alternative approaches to string playing. Mooke is founder and violist of the electro-acoustic, Scorchio Quartet, which has performed and recorded with artists such as David Bowie, Philip Glass, Trey Anastasio, Iggy Pop, as well as championing several new works. Mooke has toured internationally with Barbra Streisand, and “Star Wars in Concert.” Her catalog includes works for electric and acoustic instruments, film, theater, and dance and multimedia productions. She has received awards from ASCAP, Meet the Composer, and Arts International.